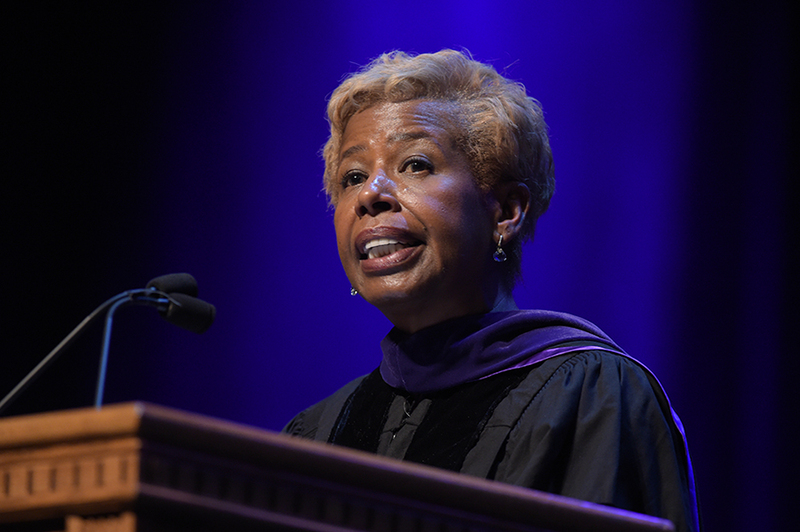 Sharon Y. Bowen (JD-MBA '82) delivers the 2018 convocation keynote address. Sharon Y. Bowen (JD-MBA '82), director of the Intercontinental Exchange, delivered the keynote address. She was the first African-American appointed as commissioner of the U.S. Commodity Futures Trading Commission, a role she held from 2014 to 2017. Prior to her role in the CFTC, Bowen was confirmed by the U.S. Senate and appointed by President Obama to serve as vice chair and acting chair of the Securities Investor Protection Corporation. Previous to her work in the Obama administration, Bowen had a renowned three-decade career in corporate and transactional law as an associate at Davis, Polk & Wardwell and later as an associate and then partner at Latham & Watkins. She received the 2011 Diversity Trailblazer Award of the New York State Bar Association and was selected as the New York City Bar Association 2007 Diversity Champion and the Metropolitan Black Bar Association 2006 Lawyer of the Year. She is also a former executive member and chair of the Law School Board. In addition to Bowen, Dean Daniel B. Rodriguez, Northwestern University President Morton Schapiro, and student speakers Steven Kobby Aye Lartey (JD ‘18), Constantin Wischnath (LLM ‘18), and Lauryn Robinson (MSL ’18) addressed the crowd. Northwestern Law’s 2018 graduating class includes 194 candidates for JD degrees and 24 candidates for joint JD-MBA degrees, 149 candidates for LLM degrees, 48 candidates for LLM degrees in taxation, 17 candidates for LLM degrees in international human rights, and 75 candidates for MSL degrees. Other degrees presented included those in the Executive LLM Programs in Seoul (8), Madrid (15), and Tel Aviv (26), and two candidates for Master of Studies in Law.